KFC T20 Big Bash League – Growing up in Melbourne, some of my favourite memories are at the MCG watching the Australian cricket legends Lillee, Marsh and Chappell slug it out against the mighty Windies in either a one day or test match. As I have matured and changed so to has the Australian cricket landscape. While Test matches may be experiencing a resurgence, thanks to a couple of wins, the once popular one day internationals have been scaled back and replaced by The KFC T20 Big Bash 20/20 series with all the fanfare of cheer leaders, fireworks, and cash/care giveaways. Each KFC T20 Big Bash League team comprises a mix of local and international players which are a general whos who of international cricket, from cricketing legends such current Australian Captain, Michael Clarke and world record holder Muthiah Muralidaran. The KFC T20 Big Bash League is marketed as high energy, non stop entertainment and all played in a three hour window. 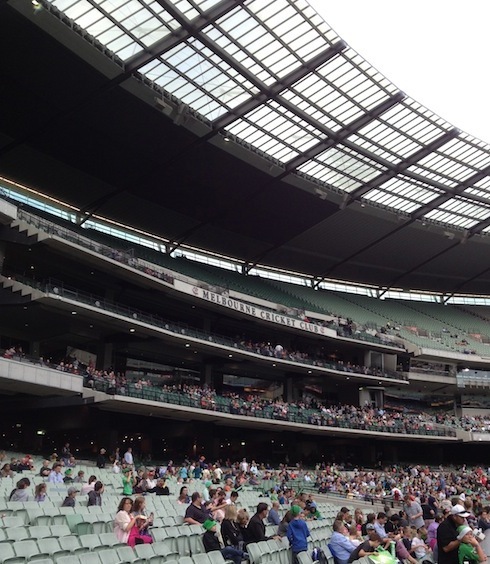 With Mr 8, these features ticked all the right boxes and so it was we found ourselves at the MCG, along with 25,000 + other fans, watching the first KFC T20 Big Bash League game between local teams Melbourne Star and Melbourne Renegades. 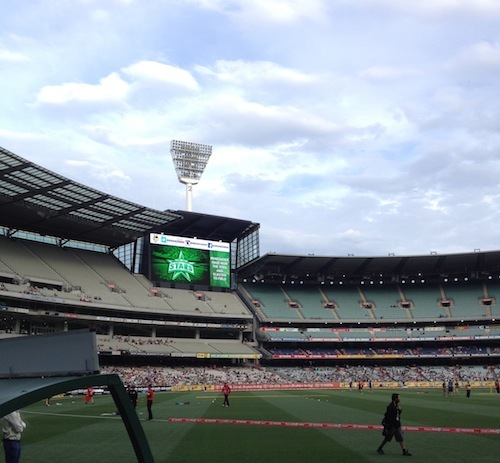 Being the home game for Melbourne Star, we had limited choice but to support them, especially with the free giveaways of inflatable bangers, cardboard fingers and scorecards – Much to the delight of Mr 8 and to the annoyance of all those around us. From the first ball right through to the last, the KFC T20 Big Bash League was non-stop action with boundaries being scored, seemingly every other ball, being marked by fireworks and dancing cheer leaders. Another non-traditional feature is the lighting effects when the ball hits the stumps and the umpires head cams. In the KFC T20 Big Bash League audience involvement is clearly paramount with a number of cash giveaways to the “best dressed stars fan” and “best dance cam” as well as overseas trips and a Mitsubishi Outlander to the fan who could hit a ball from Shane Warne the furthest. In little over three hours, the game finished with the Stars victorious and we were on our way home from the G.
The KFC T20 Big Bash League is not for the discerning cricket aficionado but is for the masses who seek high scoring, high impact entertainment packaged into a 3 hour time frame. From Mr 8’s perspective he is hooked and is now a committed Stars fan.